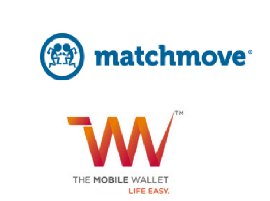 India, 25 November 2016 – The Mobile Wallet (TMW), India’s first and leading payment solution officially announced today its partnership with MatchMove, Singapore’s fastest growing Fintech company and will be integrating MatchMove’s award-winning Wallet OS into the TMW app. This will allow TMW to further boost its functionality and usability for its users to pay on the go and allow businesses to accept payments digitally. “We are delighted to have TMW choose us as its preferred Wallet OS provider. This partnership will further reinforce our commitment in providing companies the best solutions. Our ease of integration, scalability and security which our APIs have is a key advantage for companies such as TMW to take full advantage of. This partnership will further expand our footprints in the Indian market as we continue to expand as a company in the country”, says Shailesh Naik, CEO, MatchMove. TMW is a simple and easy mobile application in India to first offer complete payment solutions for day-to-day transactions of goods and services without the need and use of a physical wallet. TMW has partnered with select alliance partners and major service providers in India allowing their users to pay for mobile prepaid recharges, utility and gas bills, online shopping and much more. TMW started off with a close-looped function that limit its users to shop within their list of merchants. This partnership with MatchMove provides a wider selection of merchants available on the Mastercard network and users will also be entitled to a physical Mastercard for offline payments. Vinay Kalantri, Founder and Managing Director, The Mobile Wallet commented, “Our decision to work with MatchMove is a strategic one. Not only does it enhance our app’s offerings, but also allow us to take that next step to becoming a leader in the digital payments segment in India and open new inroads to the Southeast Asian market”. “The mobile payment industry in India is growing rapidly and is largely driven by Government’s Digital India Initiative. It is a privilege to know that our Wallet OS helps India’s very own TMW to empower cashless payments that is in line with nation’s mission in making India a cashless society and economy”, says Gaurav Mittal, Regional Director of South Asia, MatchMove. MatchMove Pay is a financial technology company that provides innovative, end-to-end enterprise payment solutions to help startups and large enterprises increase revenue and boost user engagement through its patented technologies. Our proprietary cloud-based MatchMove Wallet OS™ enables any company to easily offer their customers a fully branded, secure mobile wallet solution that includes P2P transfer, Remittance, Top Up channels, Virtual Payment Cards, Loyalty Points & Rewards, Promotions & Offers amongst many other features. MatchMove has consistently been recognised internationally for its outstanding innovation. In 2013, MatchMove was ranked as Singapore’s fastest growing technology company in Southeast Asia in the Deloitte Technology Fast 500 Asia Pacific. In 2014, MatchMove emerged as the “Top Global Innovator” in the Global fintech competition, the SWIFT Innotribe Innovator Challenge in Boston. In 2016, MatchMove was recognised as Most Promising Solution Provider – Banking and Software by APAC CIO Outlook and Most Innovative Financial Technology Provider in Singapore by Global Business Awards. MatchMove Pay is headquartered in Singapore with offices in Vietnam, Indonesia, Thailand, India, The Philippines and the USA. The Mobile Wallet (TMW) is India’s first complete payment solution that will make it easy and possible for its users to complete their daily transactions without having to reach for their physical wallets. Started in 2013 by Vinay Kalantri, TMW is his brainchild with a goal of providing a hassle free payment gateway. Through the innovative services backed by the best in technology and the highest level of safety, security and reliability, TMW offers its users daily payment needs and services like Utility Bills Payments for Electric, Gas and Phones (Mobile & Landline), Recharging Mobile Phones and DTH Connections, Making Travel Booking like airline tickets, hotel reservations, etc with India’s major service providers and TMW’s select alliance partners.